In this note we focus on a two-microphone Griffiths-Jim Beamformer (GJB) and, before we go into selected details of GJB, we start with a classic Adaptive Noise Canceller (ANC). Figure 1 depicts the ANC structure. In order to reduce the undesired signal, noise, the placement of microphones vis-à-vis the source of the desired signal and the source of the undesired signal, noise, cannot be arbitrary. Microphone M1 is to capture the speech signal naturally, it also captures the undesired signal). Microphone M2 is to capture the noise signal. M2 also captures the speech signal; we assume though that the speech components in terms of its energy is significantly smaller that the noise component. 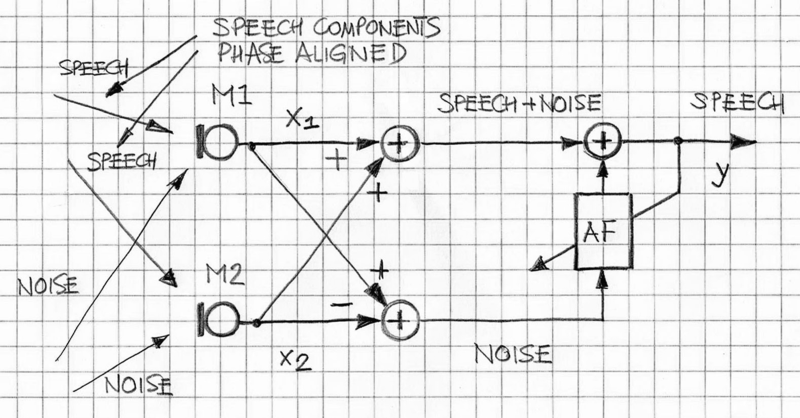 If the outlined conditions regarding the placement of the microphones are satisfied, then by adaptively removing the noise component (n) from the “speech+noise” signal (x1), the output signal, y, consists mostly of the speech signal (i.e., there is still some residual noise component), with the SNR greater than for signal x1 (cf, Ref. ). The operation of the ANC depicted in Figure 1 is quite unreliable, due to great dependency on spatial configurations of the microphones and signal sources. Thus, applications of such ANC are very limited. An adaptive microphone beamformer introduced by Griffiths and Jim addresses some of the shortcomings of the ANC. 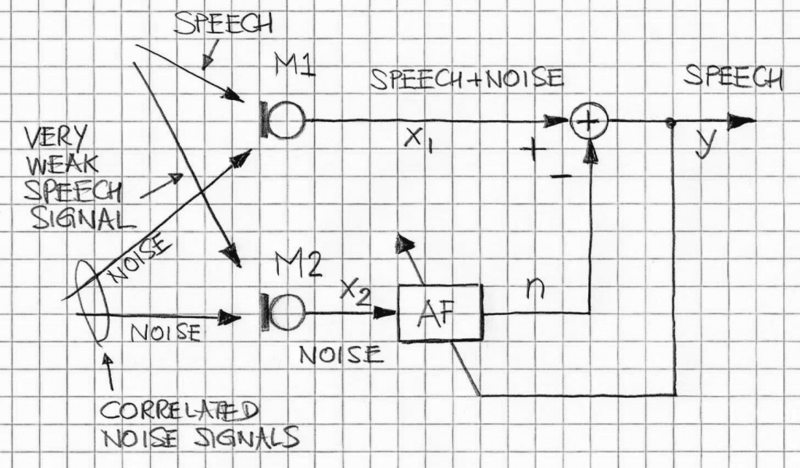 Figure 2 depicts a simplified block diagram of the two-microphone Griffiths-Jim Beamformer (cf. Ref. ). While this beamformer (a.k.a. Generalized Sidelobe Canceller, or GSC) can consist of N microphones (N > 2), we assume, for simplicity, that N=2. The Griffiths-Jim Beamformer’s algorithm requires the desired signal, speech, be phase-aligned, i..e. x1 and x2 are phase aligned. If that assumption is not met, the speech signals, y, will be distorted. While the GJB is less restrictive than the ANC in terms of geometry of microphone locations versus the sound sources’ locations, the assumption about the phase alignment is an important requirement. To remove this constraint an idea of VAD-controlled adaption was introduced (cf. Ref. ). The idea is illustrated in Figure 3. The key element of the Switched Griffiths-Jim Beamformer is controlled adaption of the phase alignment section and noise cancellation section by a Voice Activity Detection. The phase alignment section aligns x1 and x2 (during the VAD ON) so the x2 is aligned with x1. As shown in Figure 3, AF1 is in adaptation mode when VAD is on; during that time AF2 does not adapt. When the speech is absent (i.e., when VAD is OFF), the AF2 adapts and n is aligned with the noise component of x1 and, consequently, y, becomes an approximation of clean speech. Typically, AF1 (phase alignment) and AF2 (noise cancellation) use LMS adaptive filtering. 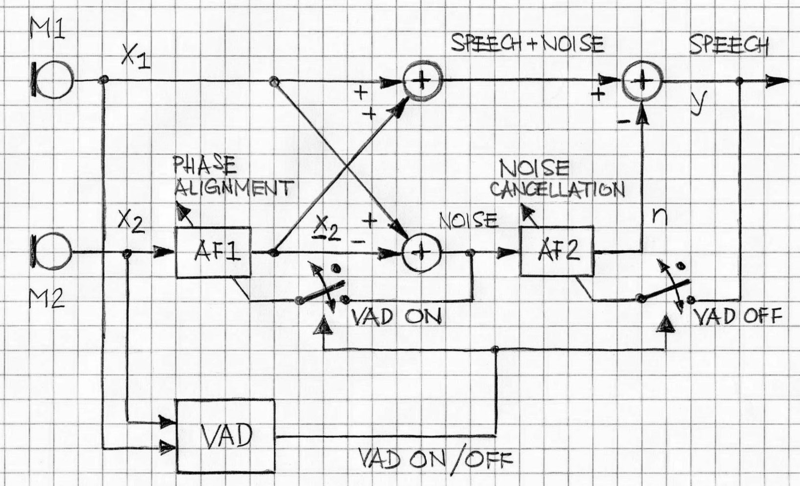 Thanks to the controlled adaptation via VAD, there are no requirements for the speech signal-free noise reference. VOCAL’s Voice Enhancement solutions include beamforming-based noise reduction software components (e.g., Ref. [4, 5]). They can be ported onto any of the typical DSP processors. Contact us to discuss your noise reduction application requirements our engineering staff. Multi-microphone Adaptive Neural Switched Griffiths-Jim Beamformer for Noise Reduction, V. Yoganathan, et al., ICSP 2010 Proc. Noise Reduction in Speech Applications, G.M. Davis (Editor), CRC Press 2002. Switching Adaptive Filters for Enhancing Noisy and Reverberant Speech from Microphone Array Recordings, D. Van Compernolle, ICASSP 1990.